Offers CD-R (48x) and CD-RW (24x) recording capability as well as DVD-ROM (16x). Records up to 650 MB of data per disc. The SM-348 Drive is available in Half-Height form factors in speeds ranging up to 48X Writing, 24X Rewriting, 48X CD Reading, and 16X DVD Reading. Combo drive combines CD-RW and DVD-ROM drives into one mechanism. The SM-348 has high capacity buffer memory (8MB) and reduces noise and vibration with DVA (Dynamic Vibration Absorber). 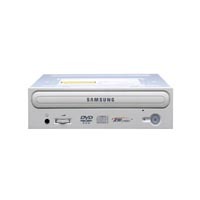 Includes drive, (1) CD-R disc, (1) CD-RW disc, Audio Cable, Drivers, Mounting Screws, software and manual. 48X CD-Recording, 24X CD-ReWriting, 48X CD-ROM Reading, and 16X DVD-ROM Reading. Adds technology to prevent Buffer Under Run Errors. EIDE/ATAPI Interface for easy installation. Advanced Optical Pick-Ups adopting Annular Mask Lens. 8MB Buffer Memory makes any DVD-ROM read smoothly. Supports variable packet CD-R,variable and fixed packet CD-RW read and write. Soft MPEG decoder plays DVD-Video without MPEG decoder board.